Prof. Youbin Zheng appeared on CBC Radio’s Quirks and Quarks on April 14. 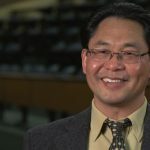 A professor in U of G’s School of Environmental Sciences, Zheng answered an audience question about whether we could make vegetable plants as hardy as daffodil plants to withstand cold and frost. Zheng talked about why some plants cannot tolerate freezing and why it might be possible to produce cold-tolerant veggies. He also explained that it is not possible to cross a tomato plant and a daffodil because they are different species. He studies environmental horticulture, nursery production and vegetable production.